To cook the pasta: fill a pot with salted water. Bring to a boil and add the pasta shells. Cook until done, then drain and set aside for later. To make the sauce: chop up all the vegetables. When you cut the tomatoes, make sure to retain their juices. For the carrot, I first removed the skin with a vegetable peeler and then sliced the rest of the carrot with the peeler. Add the garlic and olive oil to a large pan. Heat up until the garlic begins to cook and releases its juices into the oil. Add the onions and cook until soft, stirring often. Add the carrots and the pinch of red pepper flakes. Stir until the carrots are soft. Carefully add the tomatoes and their juices to the pan. Stir until integrated, then add the tomato paste and broth. Bring to a boil and then lower the heat to medium-high so that the sauce is simmering on the stove. Cook until the moisture reduces by half, about 20 minutes. At the end, add the basil and cook another 3-5 minutes until wilted. Add salt and pepper to taste. While the pasta sauce is cooking, make the cheese filling: Combine all the filling ingredients except the salt and pepper in a bowl and stir until combined. Taste. Add salt and pepper until delicious. To assemble the dish: Preheat the oven to 375 degrees. Get a 9″X13″ pan and grease or spray with cooking oil so the shells won’t stick. Pick up a pasta shell. If it is still too hot to handle, gently rinse with cool water. Fill the shell with cheese and place in the pan. Repeat until all the shells are filled. 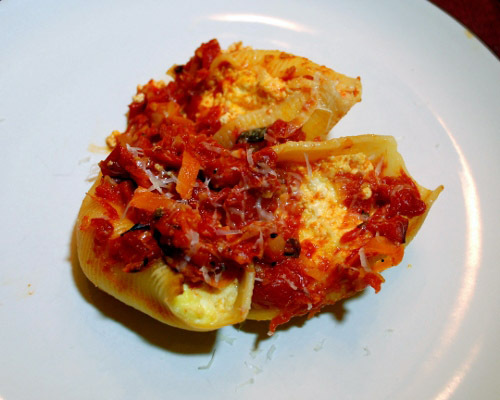 Spoon the pasta sauce over the shells. Cook in the oven about 35 minutes, or until the sauce is bubbling. Before serving, let the shells sit about 5 minutes. 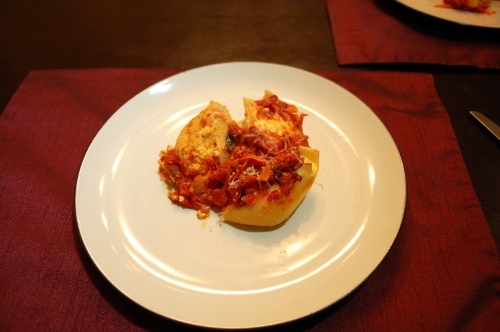 Carefully spoon each shell onto a plate–you don’t need very many, these things are filling! Top with more Parmesan cheese if desired. Enjoy!